The music world’s biggest stars are arriving at the Grammy Award ceremony in Los Angeles. Here’s are the strongest looks from the red carpet. Rap star Cardi B is up for the night’s biggest prize, album of the year, for her debut record Invasion of Privacy. Fifteen-time Grammy winner Alicia Keys is hosting this year’s ceremony. 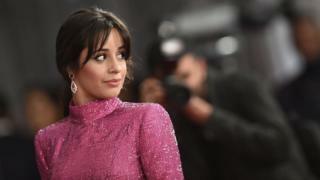 Camila Cabello will open the show with a special performance featuring not just Latin pop star J Balvin and her own grandmother. 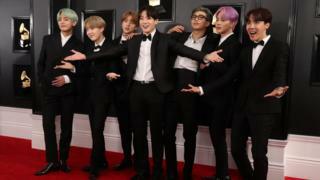 K-pop stars BTS are making their debut at the ceremony. They told E! they’d “stayed up all night” working on their next album before flying to LA. Country star Kacey Musgraves is up for album of the year, and will perform Rainbow at the ceremony. In the run-up to the Grammys, pop star Bebe Rexha posted an Instagram video claiming some designers had refused to dress her because she was a size 12 (US size 8). In the end, Monsoori came to her rescue with this stunning, ruffled red gown. Miley Cyrus will be helping honour her Godmother, Dolly Parton, who’s the subject of a special tribute at the ceremony. Janelle Monae’s Dirty Computer is up for album of the year. 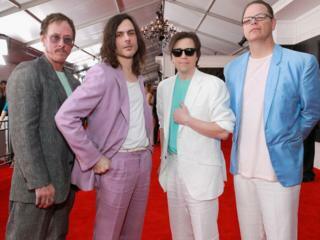 Rock band Weezer rocked a pastel colour befitting their 80s covers album look as they trod the red carpet. 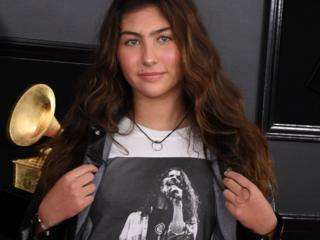 Chris Cornell’s daughter Toni accepted a posthumous award, for best rock performance, on her father’s behalf. Dolly Parton won an award for her charity work while Dua picked up her first Grammy for her collaboration with Mark Ronson and Diplo aka Silk City.